I had a bag of fresh cherries that needed to be used ASAP. I thought of making cupcakes, but I was looking to make something different. I turned to the Facebook group I created (Edible Reflections Food Group) and simply asked for ideas. 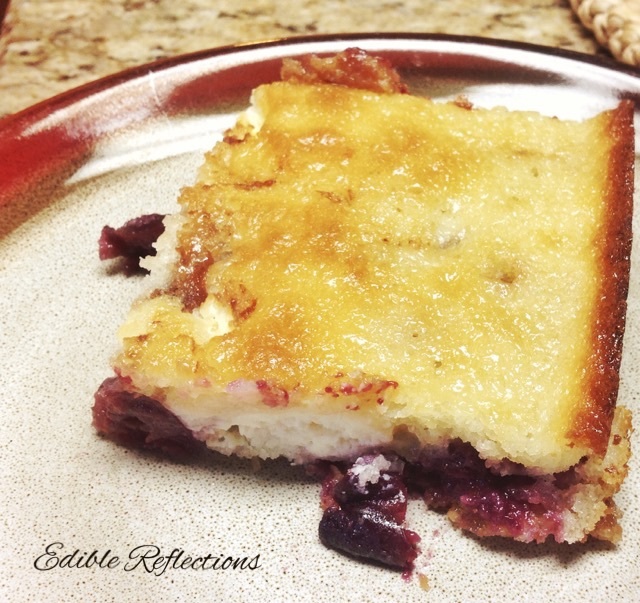 A dear friend shared Courtney Luper’s Strawberry Cream Cheese Cobbler recipe. I have to admit that while making this recipe I wasn’t sure how it would turn out. It just didn’t look pretty. Don’t judge the cake (cobbler in this case) by its recipe? I could go with that. Just go for it and hope for the best. In the end, I was pleasantly surprised. This week this post is dedicated to a wonderful blogger who unfortunately is no longer with us, Selma from Selma’s Table. 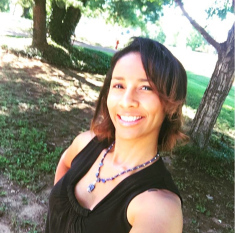 She has been an inspiration to many bloggers and active contributor to Fiesta Friday. In her honor, many across the world are cooking/baking with her in mind. Adding as many cherries as possible. After a lot of patience, I was able to finally cut into this cobbler. I do have to say it was delicious! 1- Preheat oven 350° degrees Fahrenheit. 2- Using a hand-held citrus squeezer, gently squeeze 1 cherry at a time to remove the pit. (Yes, this will take a little while and make sure you’re wearing an apron!). 3- Melt butter and pour into 9 x 13 inch glass baking dish. 4- In a small bowl, mix together the egg, milk, flour, sugar, baking powder, and salt. Pour directly over the butter in the baking dish, but do not stir. 5- Add the cherries, arranging in a single layer as much as possible. Sprinkle cream cheese pieces over the cherries. Note: Mine was done in 40 minutes. Make sure you’re keeping an eye on it on the last 10 minutes of baking. If you’ve never made anything like this, try it! It’s absolutely easy and delicious. Let me know what fruit you made and how it turned out. I’d love to hear from you. Looks simply amazing- I can almost smell the aroma through the screen! Would go great with a nice cup of good strong coffee. Yum! WOW!!! This is awesome! I too had a bag of fresh cherries, and I literally ate every one of them at my desk. Needless to say, no dinner for me yesterday!!! What a beautiful recipe! I am sure it would take my patience to not cut into it right away! Perfect dish to serve for dear Selma’s tribute.